Before you even hook your boat trailer up to your car, STOP, read this! There are a few simple, yet extremely valuable tips you need to know about reversing a boat trailer. Reversing a boat tailer doesn’t come naturally to everyone, in fact many people struggle reversing trailers. You don’t have to struggle, follow these tips and you will master the art of reversing your boat trailer in no time! Just like every skill, it can take time to learn and not everyone is going to get it right on the first try. These tips are guaranteed to help you get your boat wherever you need it to with ease. Practice – Just like learning to ride a bike or getting your car license, these things can take time. Start by hooking up a 6×4 box trailer and head to an empty or quiet supermarket carpark and practice reversing. A 6×4 trailer is one of the most difficult trailers to reverse, let alone learn with as you cannot actually see much of the trailer until you have already gone wrong. This is not necessarily a bad thing though as if you can perfect reversing a box trailer, you will no worries reversing a boat trailer. Use your mirrors – If you have the habit of turning your head around to see where you are reversing, stop that right now! By using your mirrors, you are getting the best view of what is going on behind and either side of your trailer. Continue to check for obstructions as you reverse. Things like signs, posts and potholes can make reversing a little more difficult; but if you know where they are and how to avoid them you will not have an issue. Turn the wheel – The trailer moves in the opposite direction of the steering wheel so if you want to the trailer to go left, slowly turn the wheel right. If you need the trailer to go right, slowly turn the wheel left. If you go too far, simply make a correction and continue. If you need to go forward to make this adjustment that is fine. When possible, try and get your reversing path so it is straight. If space allows you to do this, you will need to take the corner wide and sweeping. This gives you room to straighten the trailer if or when needed. Use a spotter – In addition to your mirrors, if you happen to have a passenger, use them to spot you back. They can often see things you can’t and give guidance on how to correct your path. Patience – Take your time and ease the trailer where you want it to go. Do not rush, even if you have an audience as the last thing you want to do is jack-knife your trailer because you got flustered. Ignore everyone around you (except your spotter) and take your time to get it right. Reversing a boat trailer can seem difficult and it can take some people a fair amount of repetition, but after some practice and patience, it will become second nature to you. 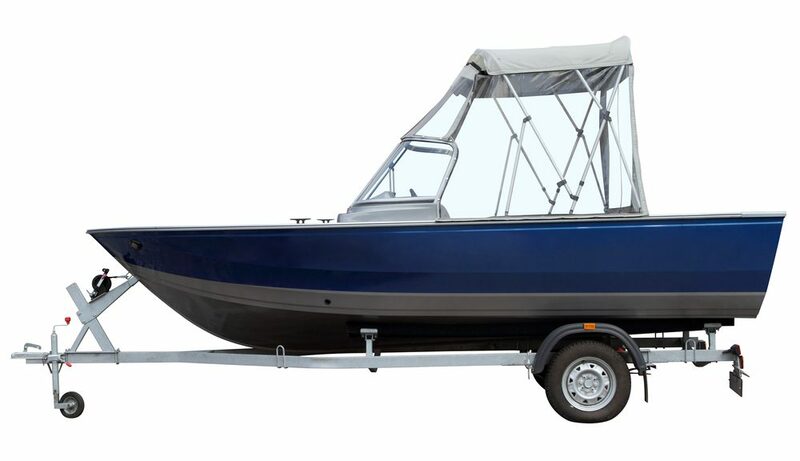 You can now load up your boat, grab your fishing rods and get ready for a great day on the water; confidently knowing you are equipped and capable of reversing a boat trailer. If you need to know more tips and tricks on reversing a boat trailer or anything else trailer related, the professional team at Almac Trailers are more than happy to help. Give them a call today on (07) 4152 3737.